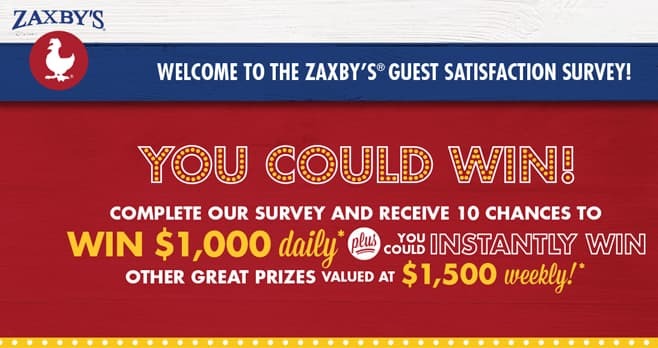 Visit myzaxbysvisit.com and complete the survey to receive 10 chances to win the Zaxby’s Survey Sweepstakes. You could win $1,000 daily plus you could instantly win other great prizes valued at $1,500 weekly. The Zaxby’s Survey Sweepstakes is open only to legal residents of the U.S. who are 18 years of age or older at the time of entry. The Sweepstakes begins at 12:00:00 a.m. ET on January 1, 2019 and ends at 11:59:59 p.m. ET on December 31, 2019. Limit of one entry per day. The grand prize consists of $1,000. Visit www.myzaxbysvisit.com to enter and see Official Rules for details.